Mid-Century Modern rectangular side table with cream colored terrazzo top and walnut inlays, mounted on tapered walnut legs, circa 1950s. The are a few tiny chips to the edge of the top, hardly visible because of the terrazzo pattern, please refer to the detailed photos. Good. Please refer to the description. Centre table with beautiful geometric starburst inlay veneer pattern and gild wood edge, mounted on a triangular base with claw feet and carved black twisted column. Mid-Century Modern walnut base terrazzo top occasional side table. Beautiful solid walnut side table, circa 1950s. Sculptural propeller form base with glass top. Side table on chrome base with terrazzo top and side covered with a cork plate. Harvey Probber Terrazzo top side table. 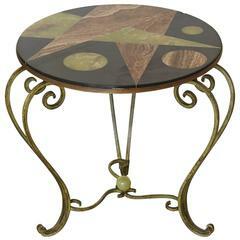 Table has a walnut base with an octagonal shaped terrazzo top with multiple marble shaped inlay pattern. Vintage rattan and wicker rectangular side table with clear glass top. All the shelves are woven, like all three sides. Size: 16 x 22 x 25 H.